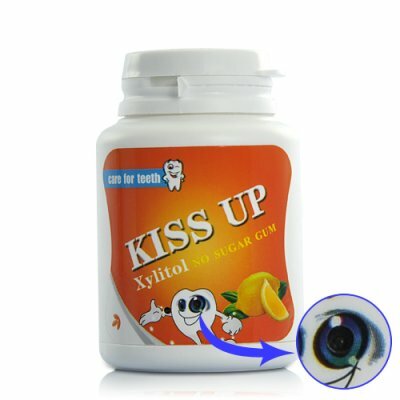 Successfully Added Camera Chewing Gum Container (Micro SD, Motion Detection) to your Shopping Cart. This is one gadget you can leave right out in the open and no one will ever suspect a thing! This extremely discreet camera is hidden within a normal looking chewing gum container. Fill it up with some gum and place it just about anywhere to capture high quality undercover videos without anyone ever suspecting a thing. It’s easy to use too, thanks to the motion detection recording feature which records video only when movement is detected in front of the lens. The tiny pinhole lens is well hidden into the side of the container and the operation buttons are located underneath the sticker which makes them invisible to the naked eye. The bottom of the container twists off so you can access the hidden USB port and Micro SD card slot, while the LED indicator lets you know when the recording has begun. This is definitely one of our most inconspicuous gadgets yet! If you are looking for a camera that can be used in just about any environment and without suspect, then this is one gadget you are not going to want to pass up. Order now though because at this price supplies are expected to go fast.